Yesterday we got a room for two nights under the Irish Loop Cafe. 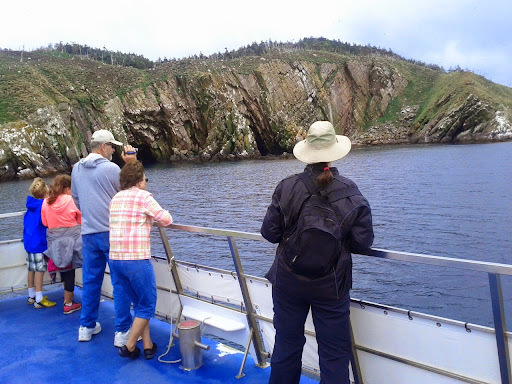 We also went on a Gatheralls boat tour, then went for the evening to George Street in St John's. Everyone says you should not drive at night in Newfoundland, but we did anyway, and arrived back at our room at 11:30 PM. This is why. We started out for town at 6:30 because we both fell asleep after the boat tour. Then we had trouble finding the Sundance Saloon because Google maps mislocated it at Queen and Water, also Queen has no street sign at Water. Then we found out there was a festival going on, and it cost $30 per person to enter George St., which we paid. 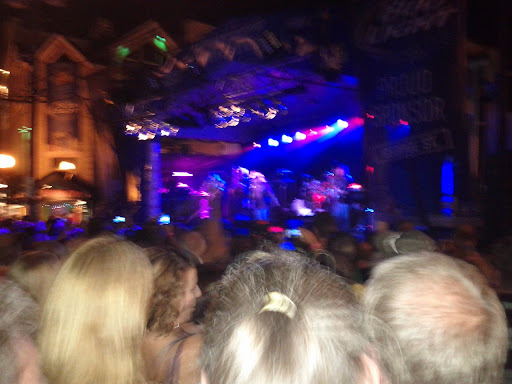 Then, we walked the length of the street to get our money's worth which is slow because it's packed with people, and Dr Hook hasn't even started playing yet. We ordered wings and nachos, but could only order a Labatt beer because of the festival. Just a side note. Newfoundland seems to have a lot of rules that only make sense to Newfoundlanders, like you need to have a reservation to go standby. So when I'm told a new rule I don't ask for further clarification, it just gets worse. Now back to the beer. I order a Lime-a-rita because I see a giant picture on the wall, but in real life, the can is like a Puffin, WAY smaller than you ever imagined. Finally, a dark ride home is made brighter by the off road lights of a monster truck tailgating all the way home.